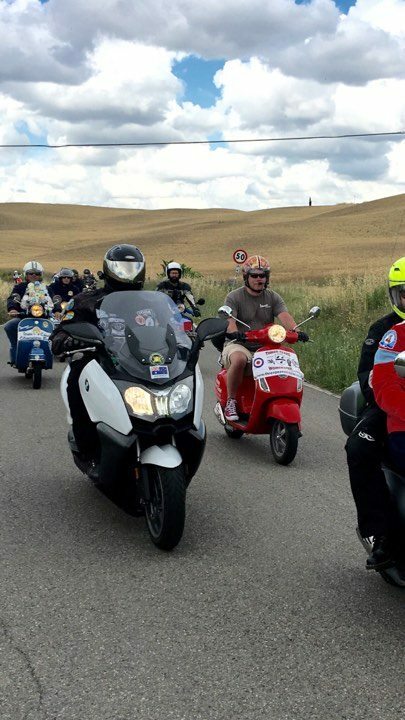 New Tuscany Scooter Rental announces the introduction of Special Vespa Club Rally Tours for 2017. 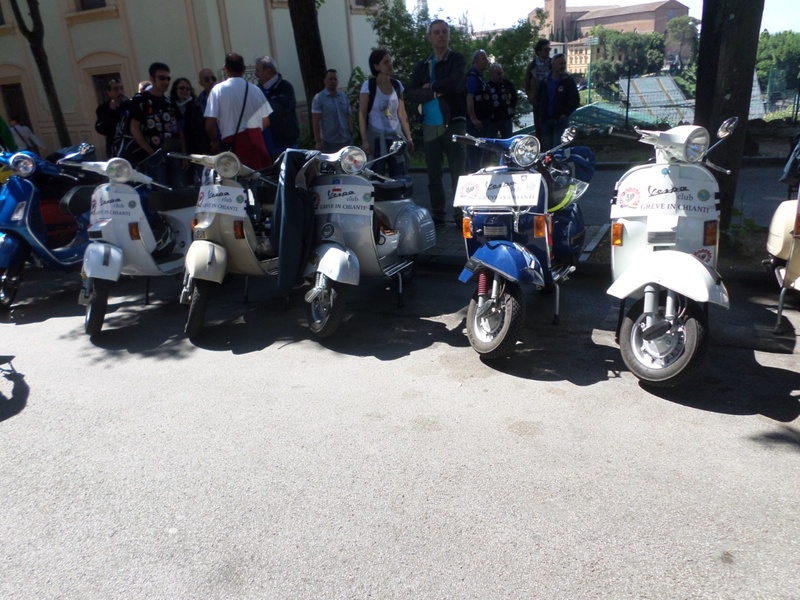 The tours are designed by Scooter Enthusiasts for Scooter Enthusiasts, and inspired by the fruit of their membership of Florence Vespa Club and an ad hoc tour completed the year prior. 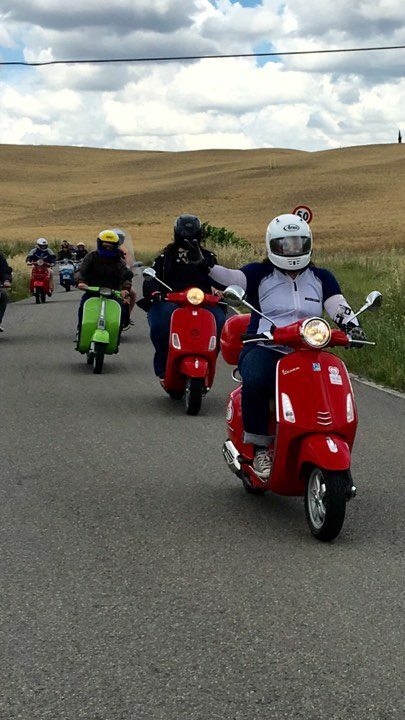 I was fortunate enough to take part in one of these tours when in Italy with a group of scooter enthusiasts. 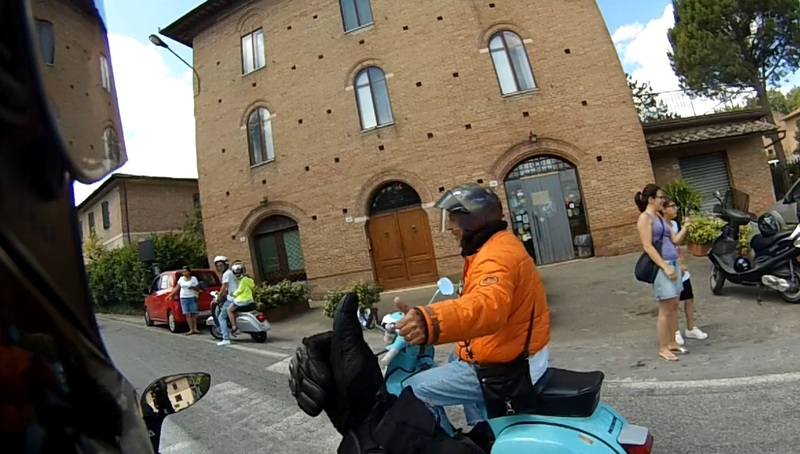 As noted in the description in the new tours, the location of the rallies are not always close to where the New Tuscany Scooter hire locations are. 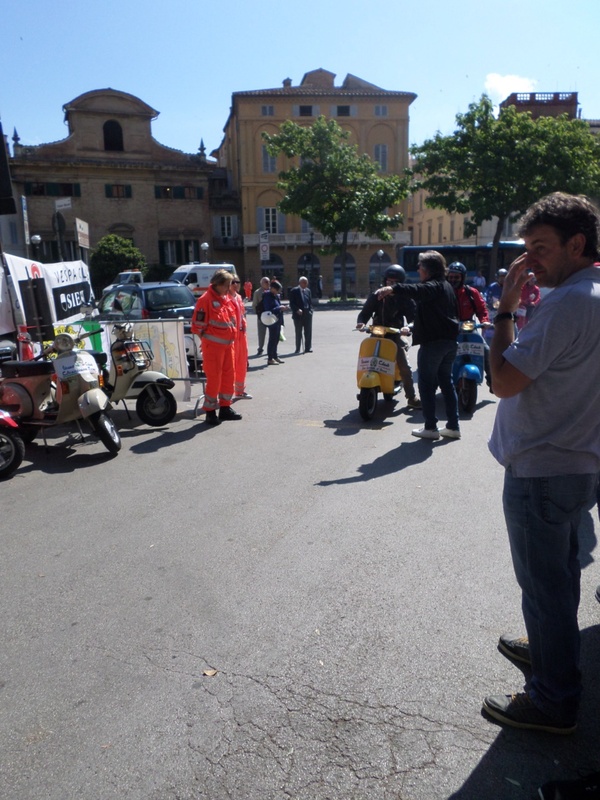 As we were a group and would be riding together it was agreed to meet Lorenzo from the Florence Vespa Club in Siena before continuing on to the rally. 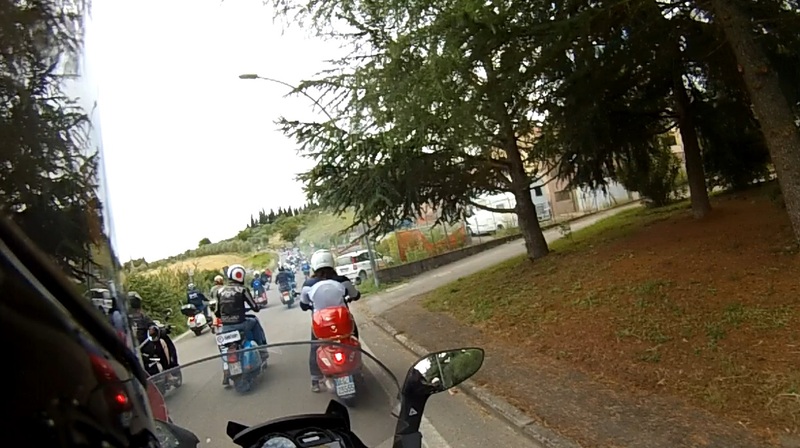 Our group consisted of members from a variety of scooter clubs and crews. Myself, a member of Brisbane Cane Toads (though I had a Los Wankas sticker on the scoot and was wearing one of my favourite T-shirts from the Original Chrome Nasty Scooter Group); Drew, a member of Three Pears S.C. Worchester, Firkins Scooter Club Tacoma and the Disobedience Crew; Delia and Nicki, representing the Seattle Metro Betties, though Delia is also a member of Greater Vancouver Vespa Club and Nicki is also a member and officer of Seattle Vespa Club. Others in attendance were Mike, a member of Disobedience Crew Seattle; Kat, from New Orleans, a member of NOLA Scooter Girls and Holis, also from New Orleans. 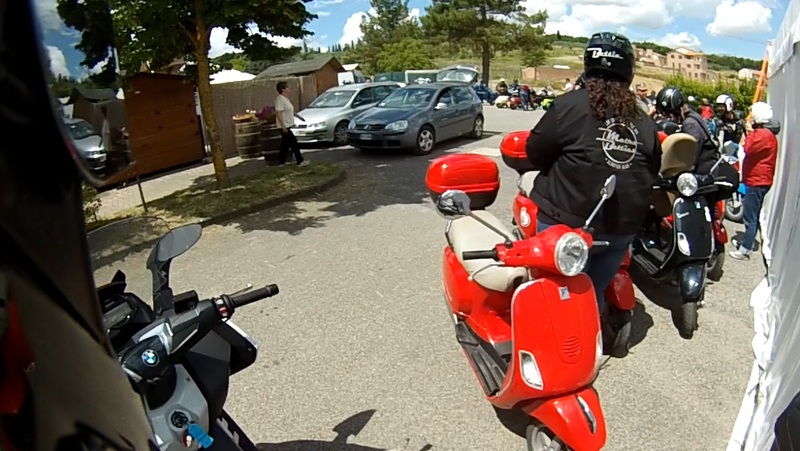 Once we rendezvoused with Lorenzo we went straight to the rally, as we had already missed the breakfast portion and needed to arrive and get registered before the ride got under way. 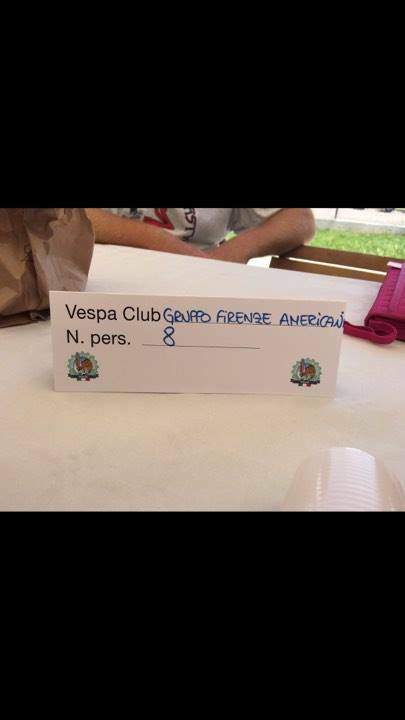 The rally registration for us was “Gruppo Firenze Americani.” The rally pack included the usual items, stickers, map and some different coloured tickets. 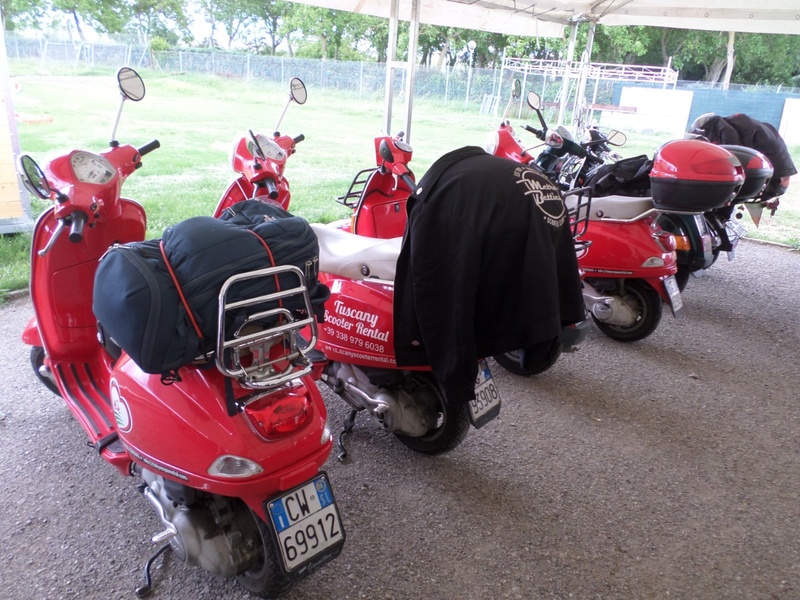 We parked with other scooters near the entrance; our pack of scooters included five modern Vespas in Dragon Red, a Black one, my BMW C650 & Lorenzo’s PX. 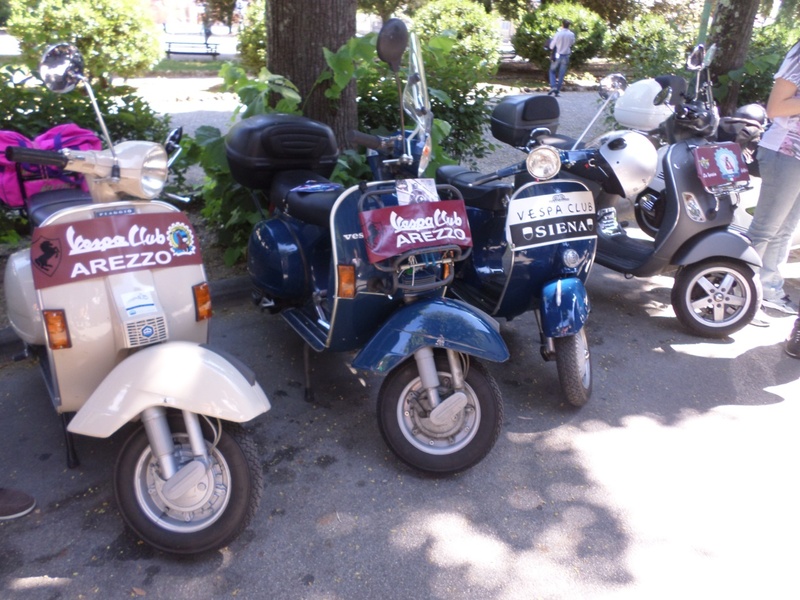 While we parked our scooters next to others it became clear the clubs were mostly made up of PX and older scooters, with some different individualisation. 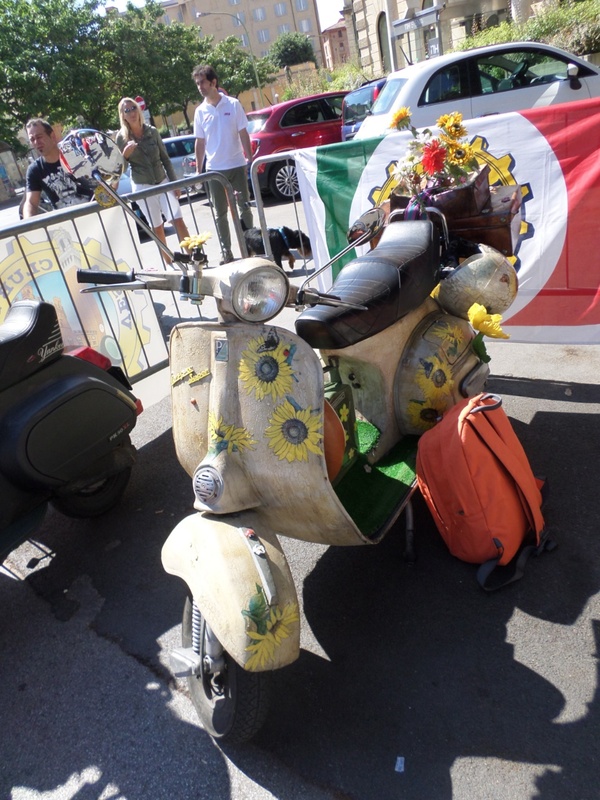 It was hard to miss the Sunflower themed scoot, From here things were totally eye opening, as part of registration we had been given tickets for use later in the rally along with a map, stickers, etc in rally pack. 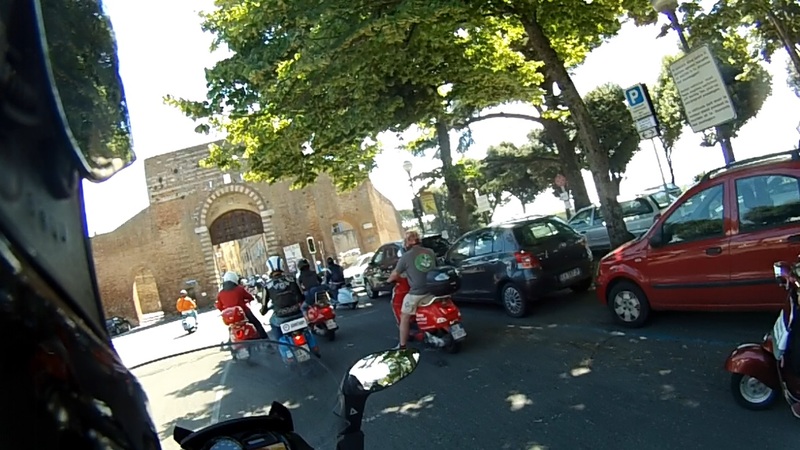 Once registered we had to go back to our rides and proceed through an inflated arch where there was a professional photographer employed to take rider photographs into the larger group of parked scooters in the laneway behind, with background music playing we started walking around to enjoy the real feast of scooters to see. 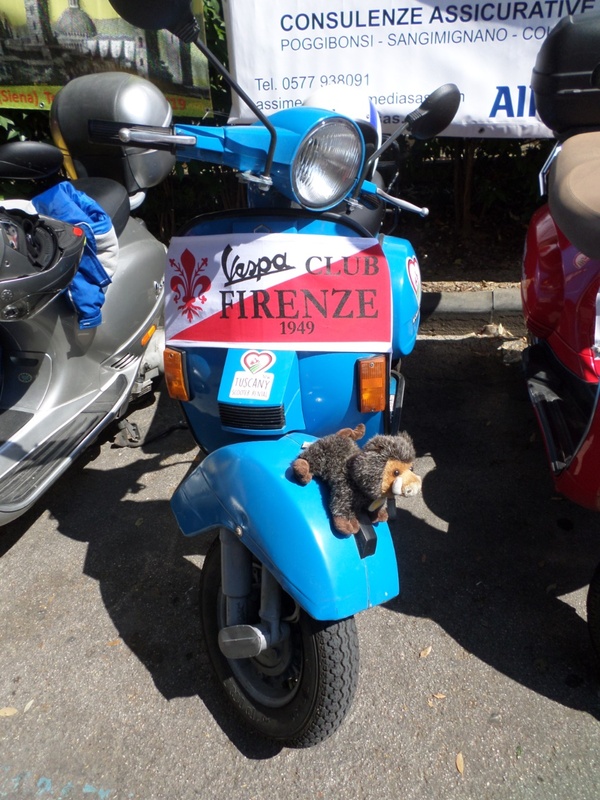 I had brought some Brisbane Canetoad leg shield banners over and traded one with a member of Vespa club of Bologna who’s daughter is studying in Australia and he was keen to have an Australian banner. 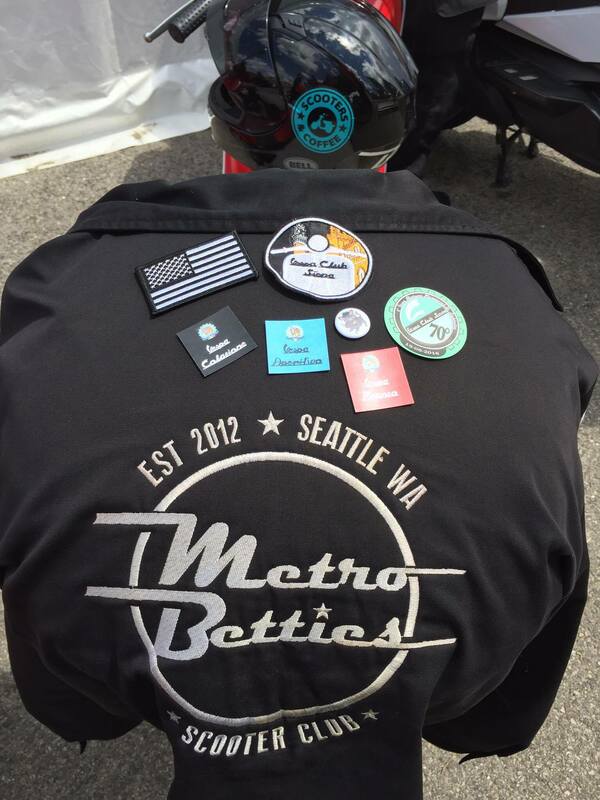 I had become separated from some of our group, elsewhere Drew had revealed a ziplock of various spare patches he had brought with him. Delia had been asked to bring our spare patches but, unfortunately forgot and was forced to witness the almost instant frenzy of activity around Drew, with scooterists trying to get first looks and dibs on trading patches from clubs unknown, and it was exciting to see everyone barter. 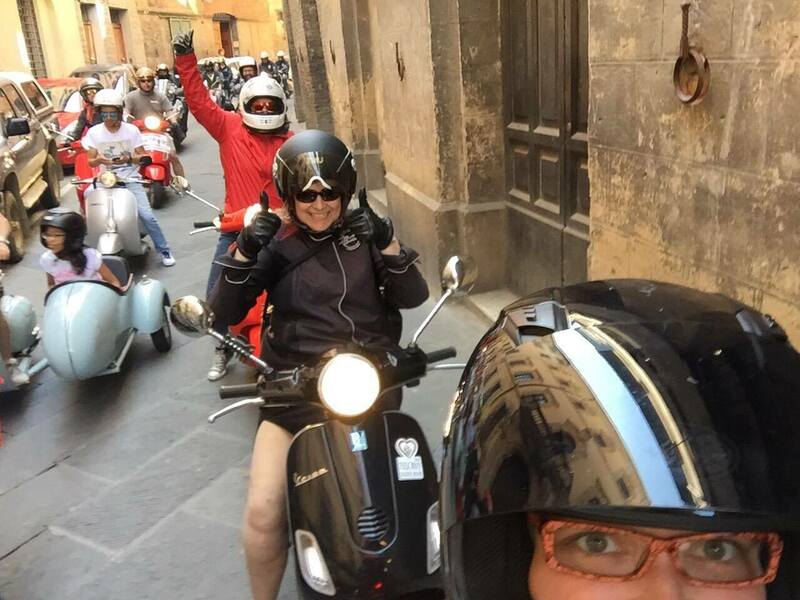 Any scooterists joining New Tuscany Scooter Rental for a scooter rally should learn from Delia’s mistake and bring their spare patches and scooter swag to trade with the local clubs. 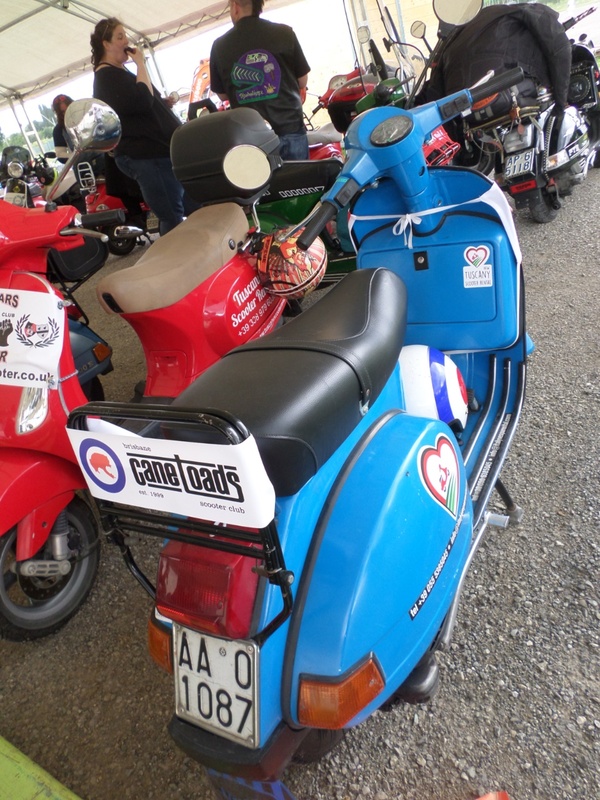 During Delia’s walk down the line of scooters being proudly displayed and dressed, she ran across a fellow wearing a Vespa Club of Canada Patch and stopped to talk to him and to say this that is the country where she is from. 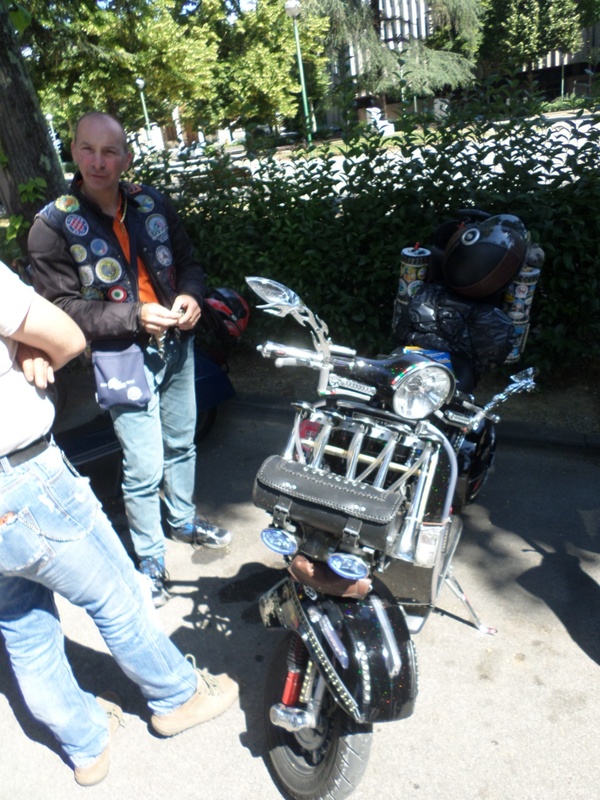 He insisted on taking a photo with her even though he could not recall where he obtained that patch. 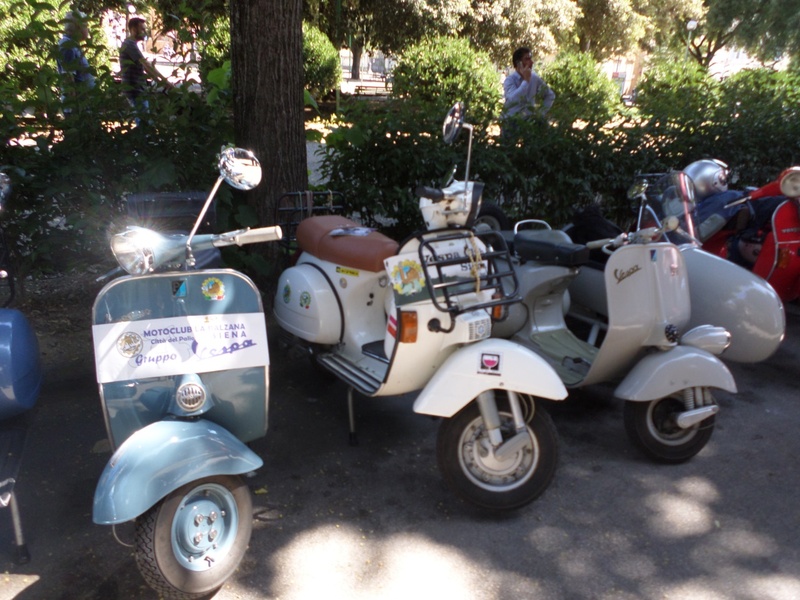 All of the scooterists were great and we mingled in as much as our lack of Italian language and others’ strength in English language allowed, but even with some complete language barriers we felt very welcome and included. 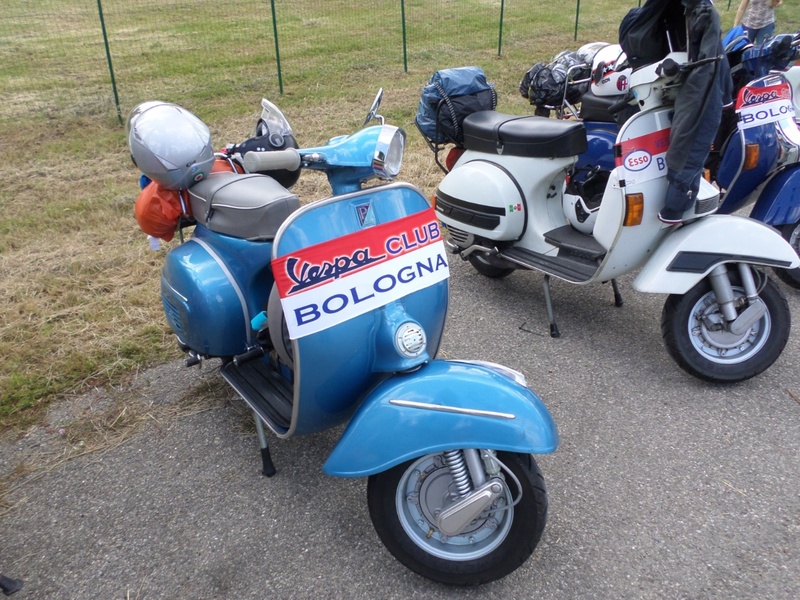 Whilst we were there, brochures and flyers for other rallies were being passed around or left on parked scooter seats, you could spend the summer weekends at rallies it seemed. 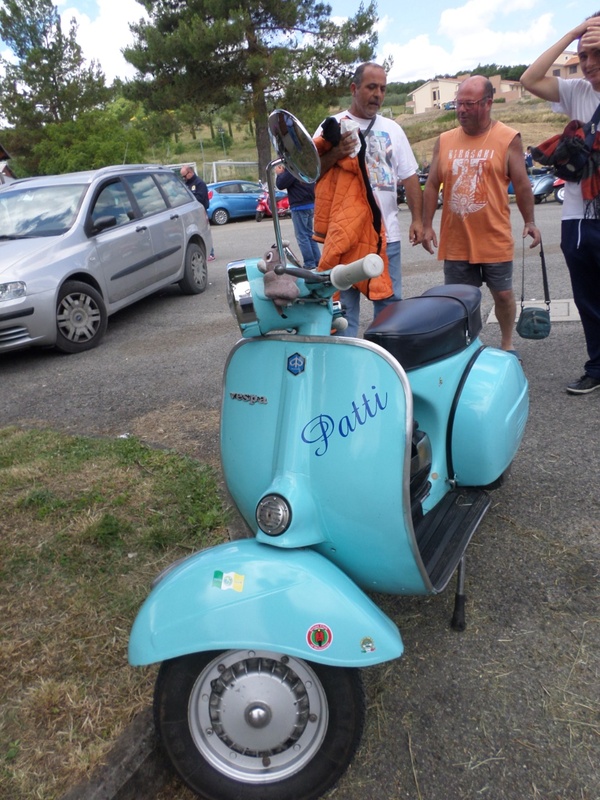 But we were not there to spend the day in the shade of the trees, the call to get ready to ride was made and our small shoal of Vespa fish merged in with the huge, colourful sea of Vespas from clubs all around Italy and abroad. 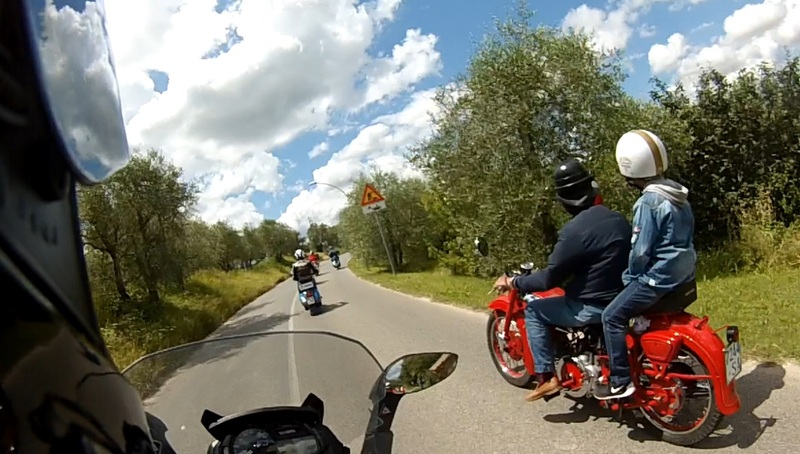 Some modern and quirky, some vintage, some sleek and smooth, every one with a rider that was proud to be taking part in the rally. 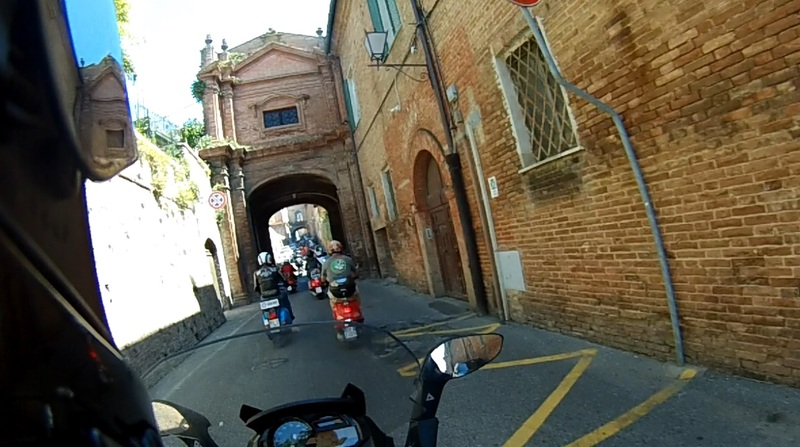 We departed and went along some local roads and roundabouts and a gas stop inside a mechanical shop at the start of the Siena rally. 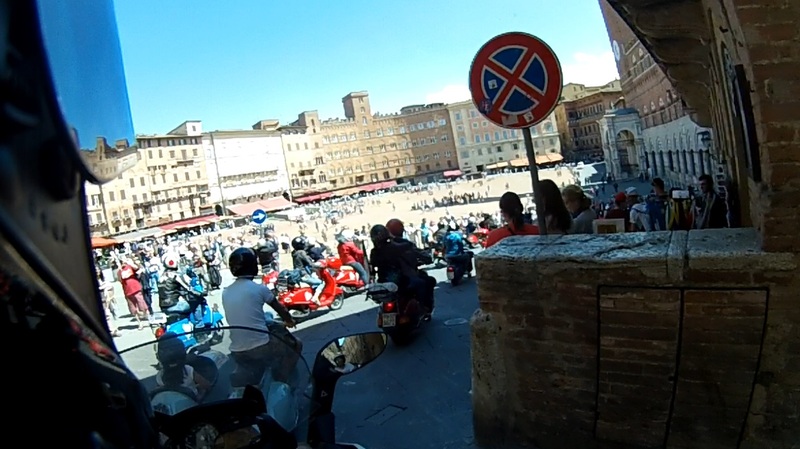 Nobody would know gas would be available there, (but nice planning on the Club’s part) before entering the historical streets and laneways of Siena, the sound of such a large group of scooters being trapped by the city walls making quite a spectacle and a buzz being part of it. 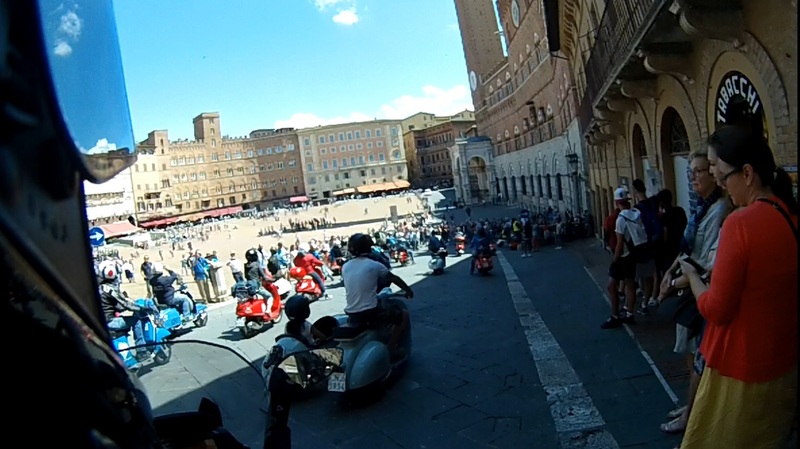 As a group we got to make a partial circuit of the Piazza del Campo, where the famous Palio Horse Races take place twice a year. 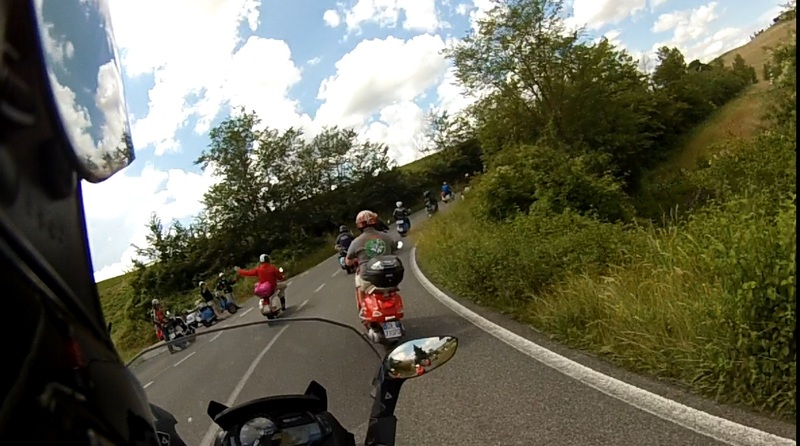 After this we were out in the country, and on our way to the next stop. 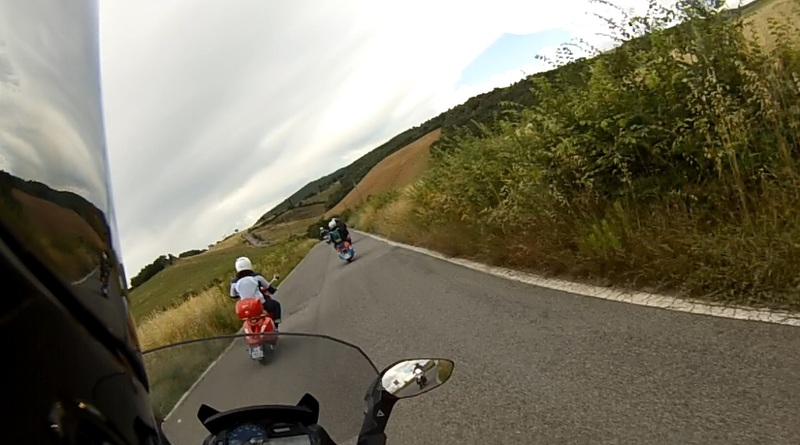 We enjoyed an incredible 45 minutes of powering along the Maremma, an other worldy piece of the Italian country side. 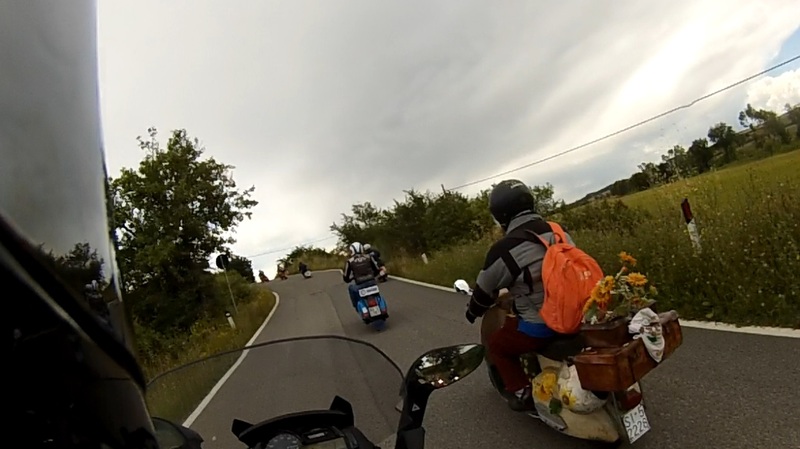 During the ride, it was an amazing sight to see the unending stretch of Vespas as we took long curvy roads, the countryside seemingly more beautiful over every hill, which was truly made for riding scooters. 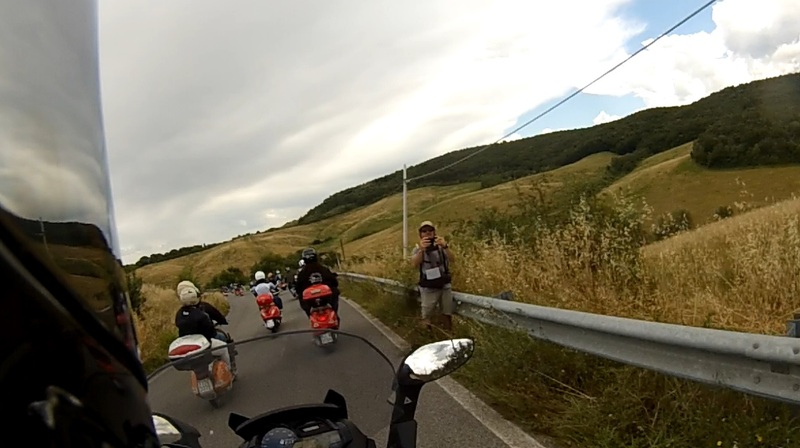 Somehow the photographer would magically appear in front of us shooting photos of every rider which would later be available for sale. 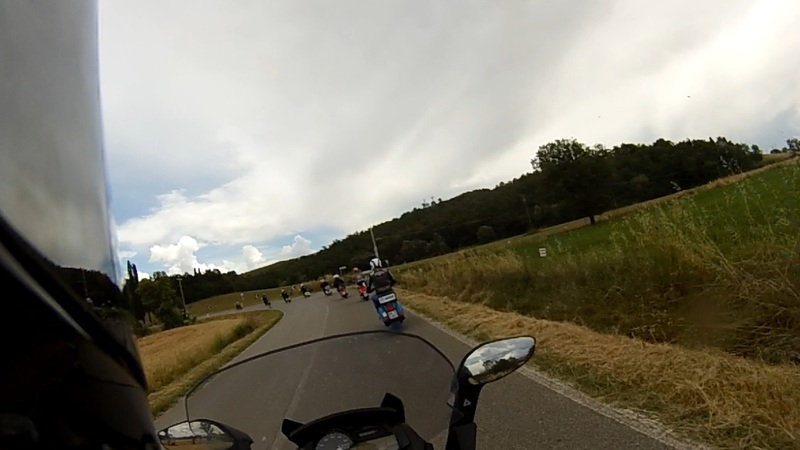 Finally we turned down a small side road and into an area which contained big BBQs that a guy was heating with a blow torch, seemingly the end of the ride. I thought this was it, short but fun. 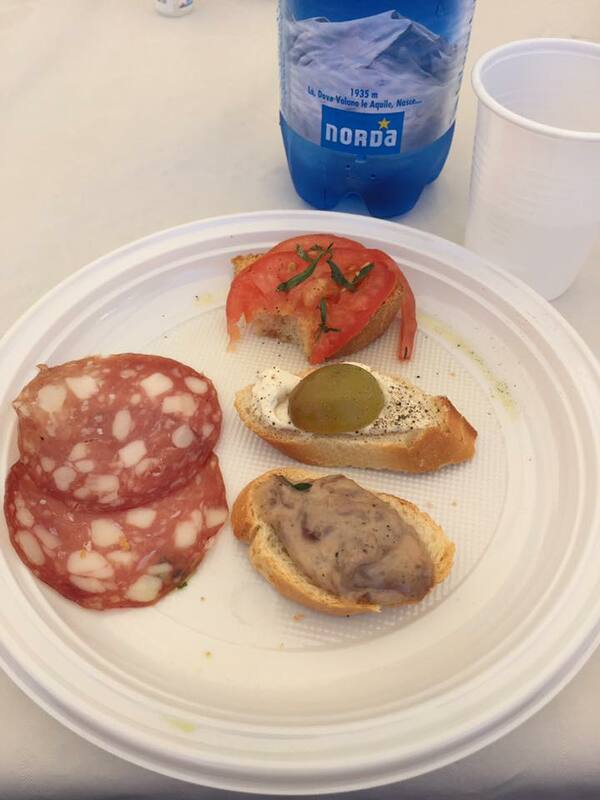 However, after parking and speaking with our host it was revealed that this is an Aperitif stop, something I have never encountered before – closest we get is a morning tea stop. 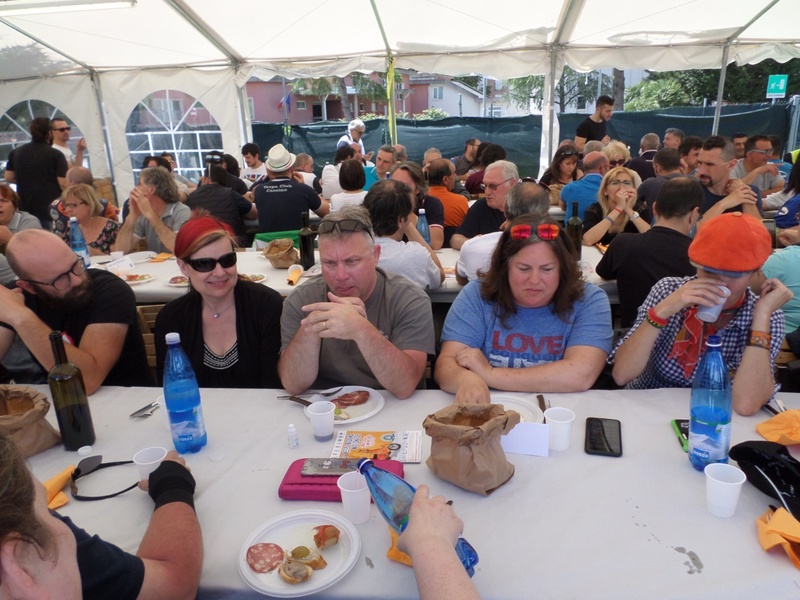 Lorenzo encouraged us to open our rally packs and locate our colourful meal tickets, as the orange ticket was the “Aperitif” ticket which I traded for my drink of choice, with both alcoholic and non-alcoholic options available. 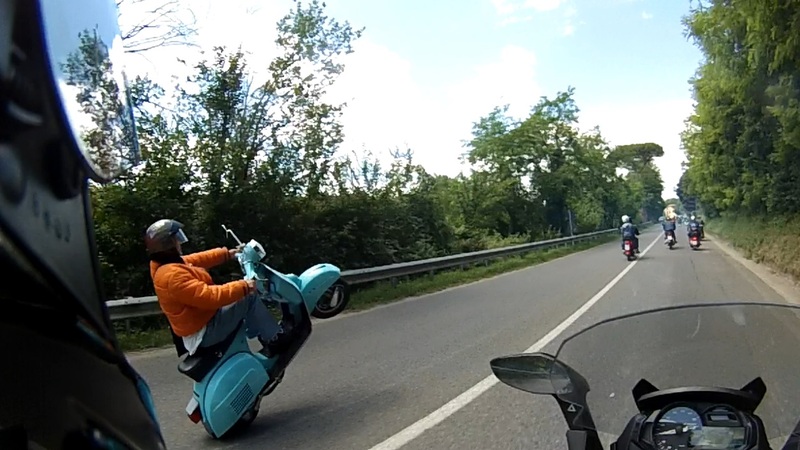 After a little more trading, I only had the one Vespa club of Melbourne sticker (that came with the rally pack at the National rally in Renmark), which went to a scooter named Patti, that had been entertaining me most of the ride with Wheelies and other stunt riding along the way, great guy and scooter. 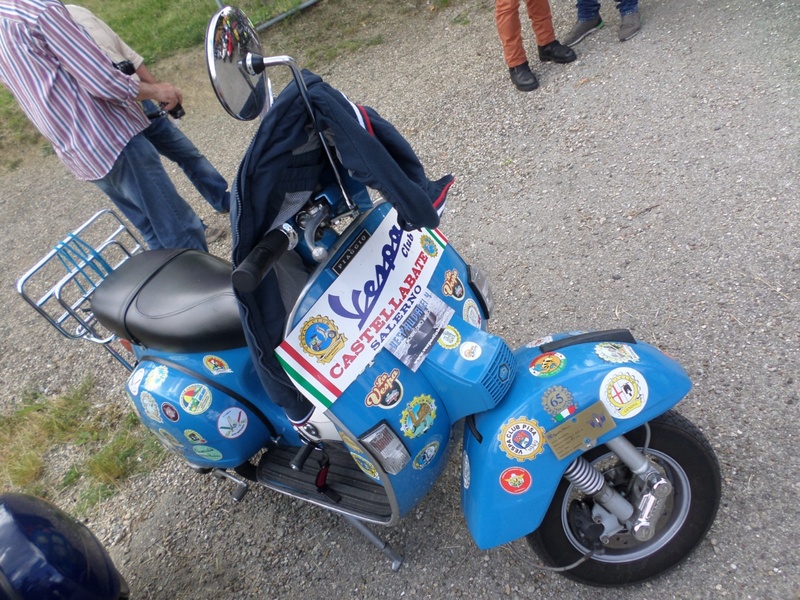 If I had more Vespa Club of Melbourne merchandise it all would have gone as I was approached several times to enquire if I had more of them. 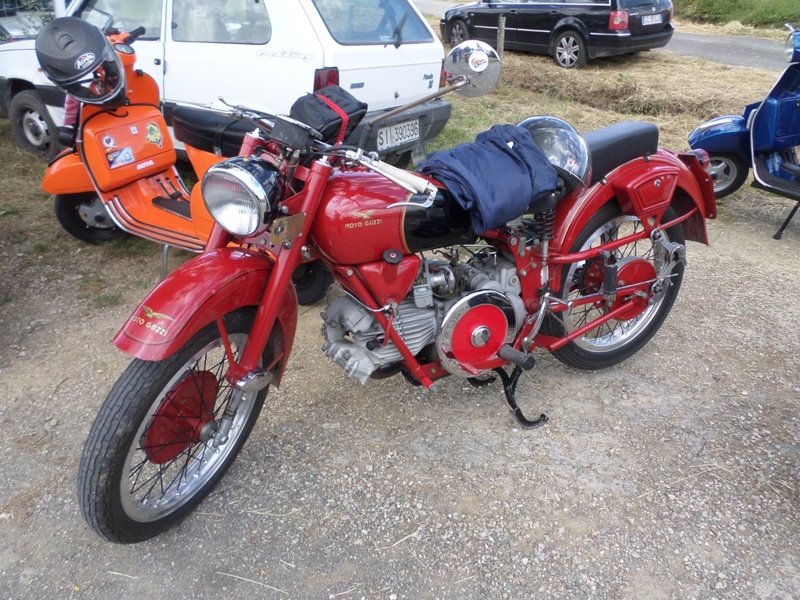 It seemed the requests were not because they were familair with the club, but more because quite a few of club members have family in Melbourne and Victoria. 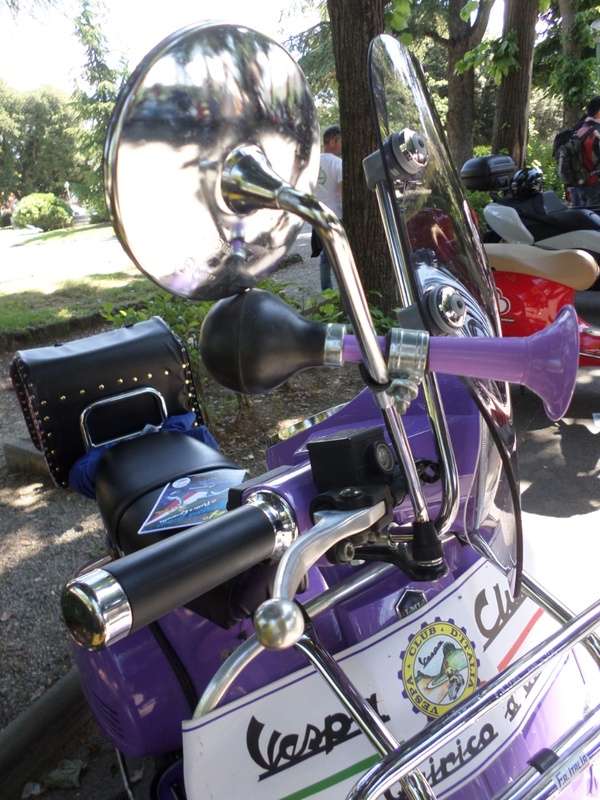 I traded a couple more Brisbane Canetoad banners for other Vespa club leg shield banners before it was time to get ready to ride again. 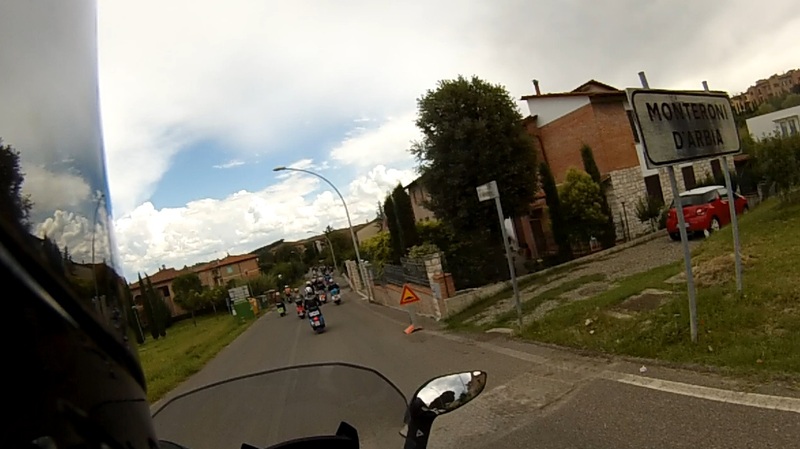 A bit more riding through the country being stalked by the ride’s professional photographers, who were popping up at different places to take more pictures before we arrived at Asciano, a little town that it looked like we were going to ride past. 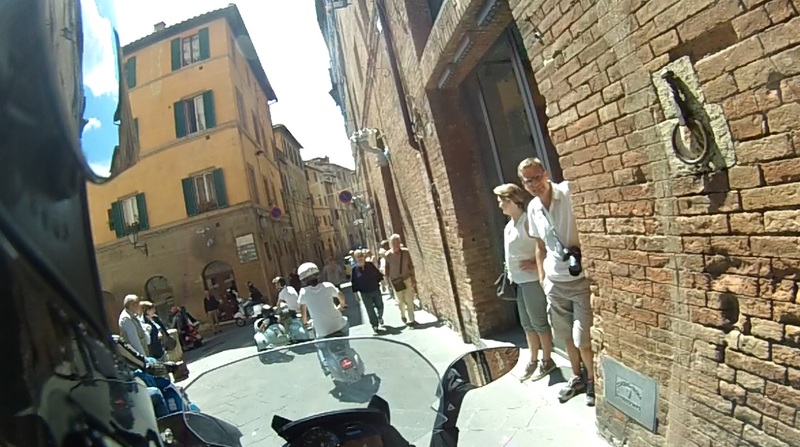 To our surprise, actually we circled back and rode down the market streets to the bewilderment of tourists and locals alike. 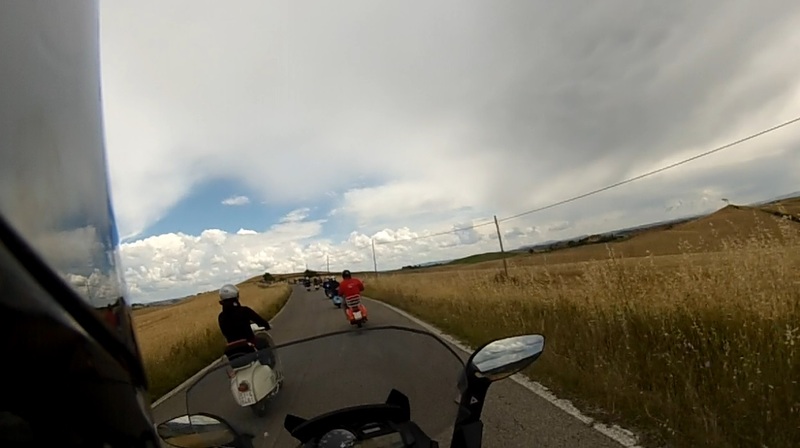 After this it was a short ride out to the town’s football pitch for lunch! 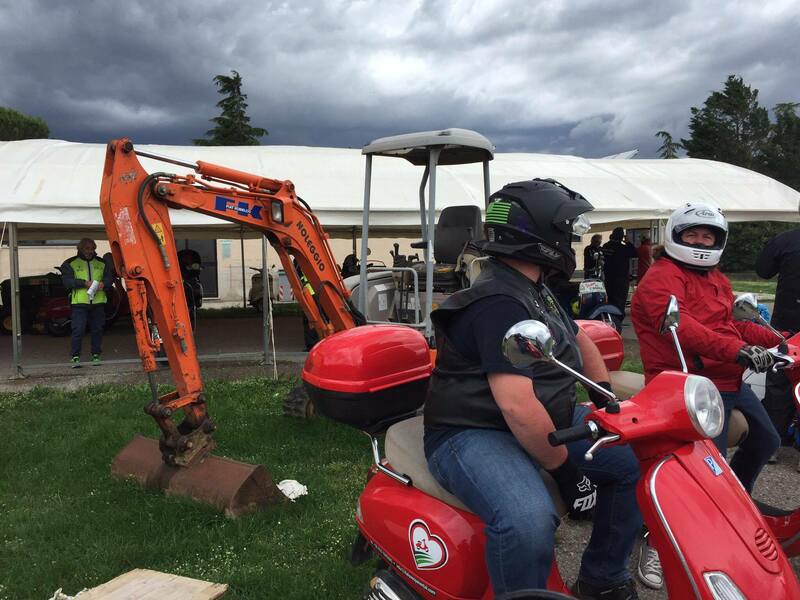 There were marquees for scooters as it was threatening to rain all day, marquees for the sit down meal, both of which had the sides on initially as some rain had passed by. 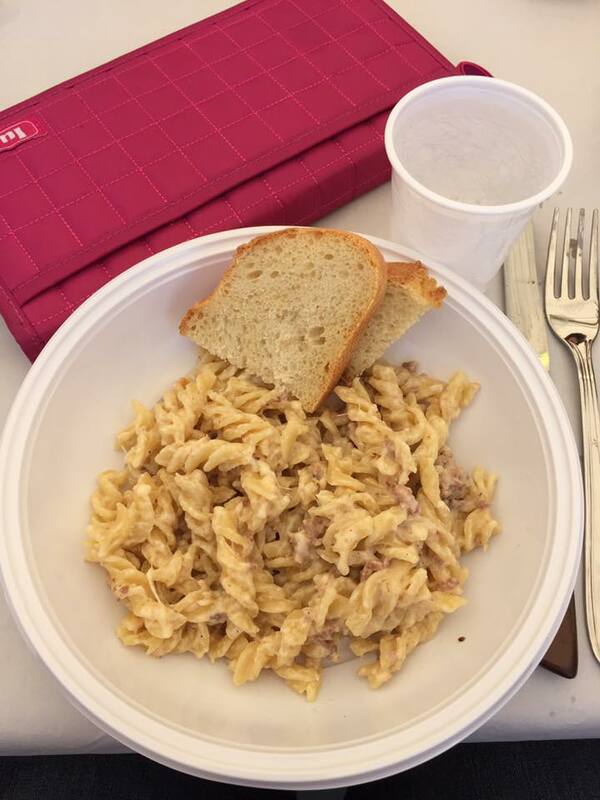 Our hosts guided us to the section of table that had been reserved for us, took our “Cena” meal ticket, and there were some bags of bread on the table with water and wine bottles and glasses. 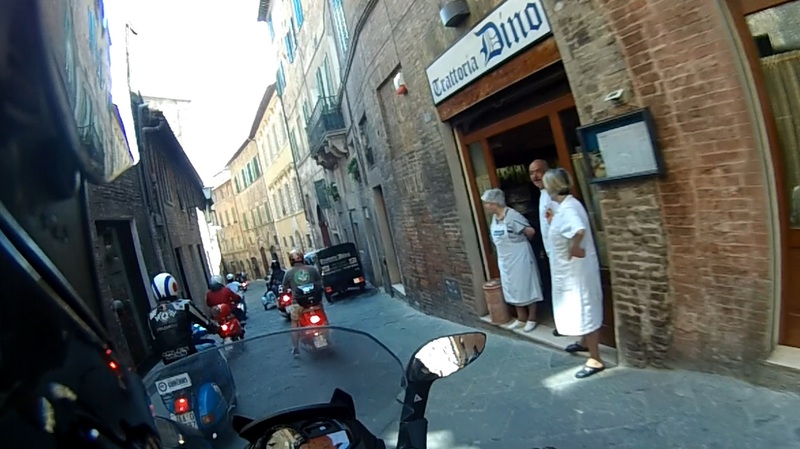 Nothing out of the ordinary at this point, lots of happy people and the dressings of an Italian restaurant. 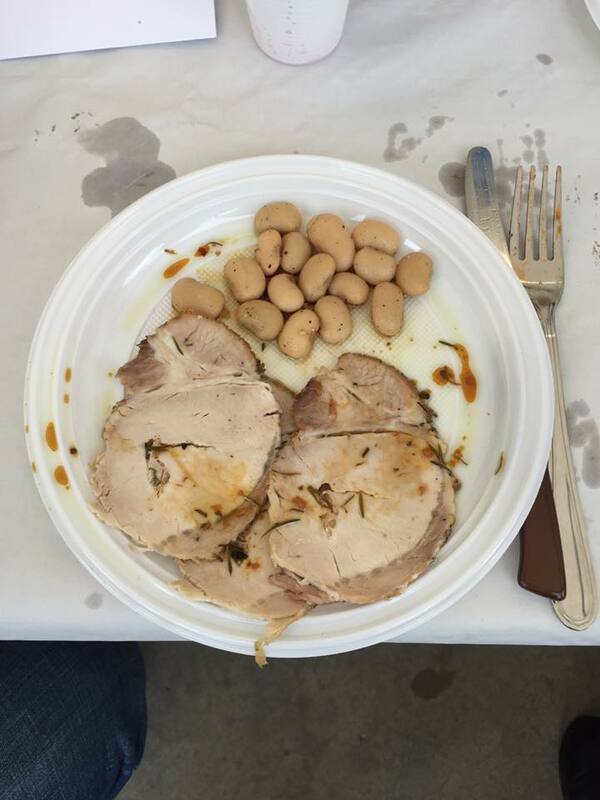 The first course was served, some antipasto, some more bread and it was cleared, then a short time later another plate arrived and we assumed that would be it… But we were wrong. 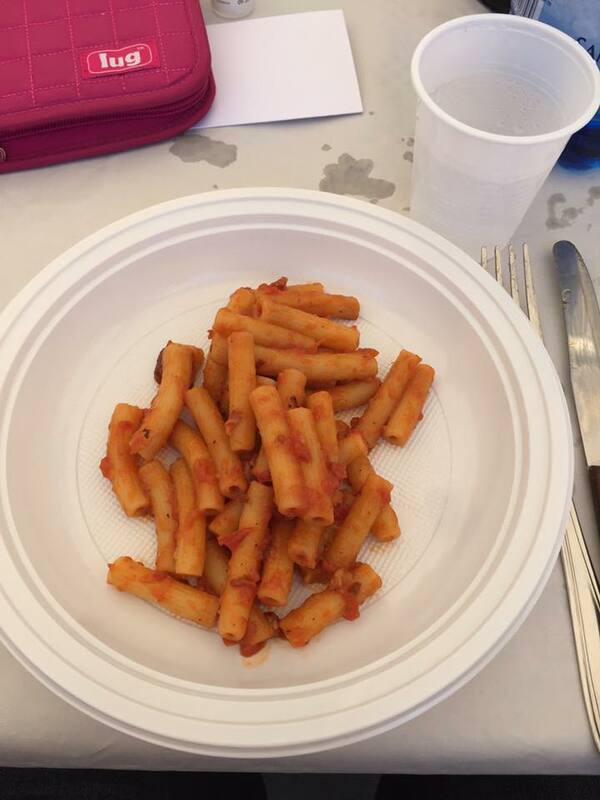 More pasta plates were served, then some roast meat and beans, the traditional salad course at the end of the meal (a welcome sight for our lone vegetarian, Holis), all with bottomless bottles of wine and water and in our case, bread. 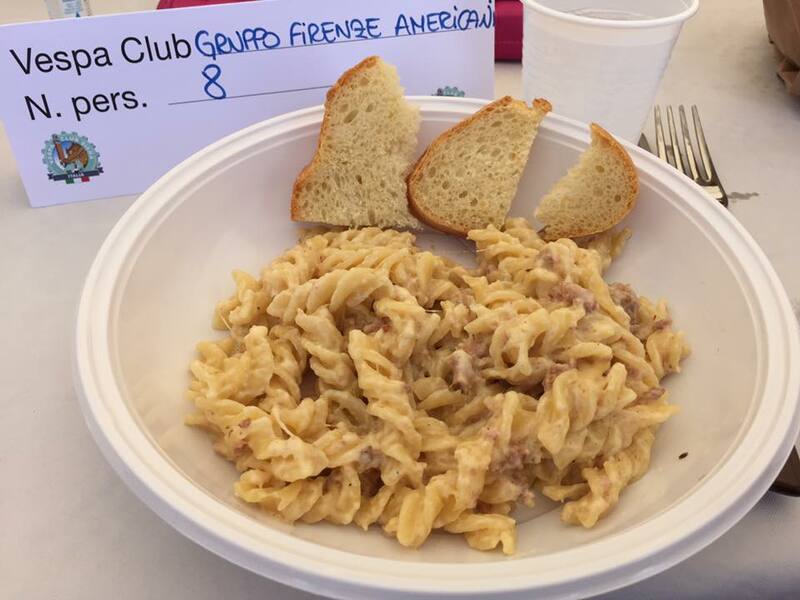 An incredible feast that seemed that it would never end (in a good way), the Siena Club must have brought some ‘Nonnas’ to prepare the meal, as the antipasto was delicious and each pasta dish was perfectly cooked, which is near impossible for what was a huge park picnic. 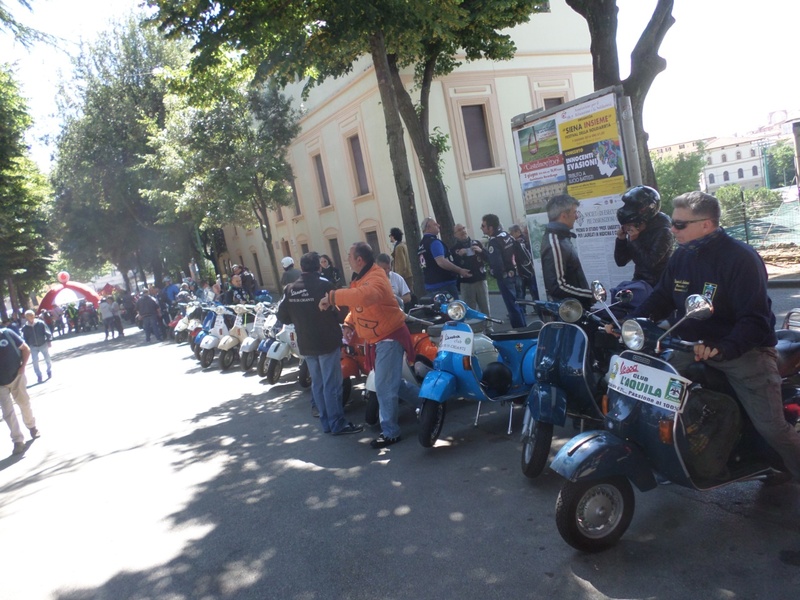 This particular rally happened to be a Memorial rally to celebrate the life of a local scooter legend, David Soldatini. Club members passed around the microphone to share stories and songs about David, and then started the long-awaited raffle. 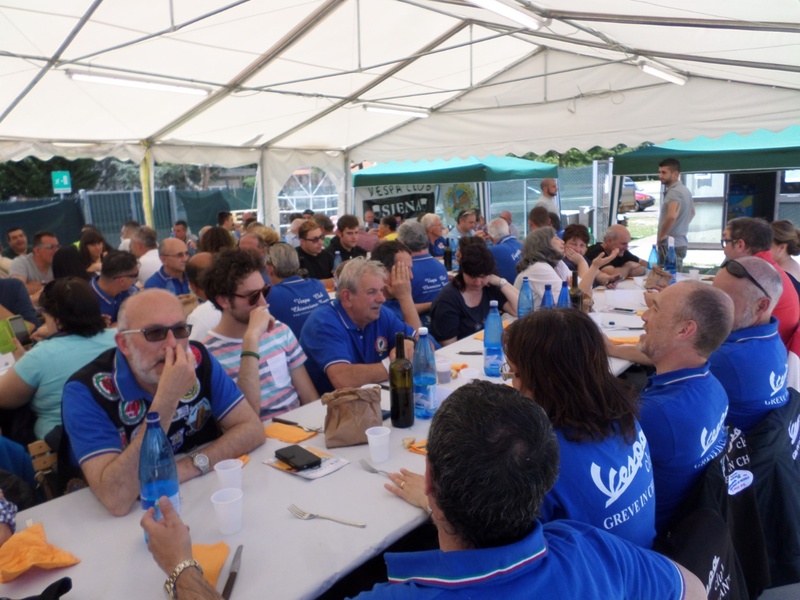 But there was some shuffling and stirring around the tables as trophies and prizes were awarded, as slightly obscured from where we were sitting there were some dark clouds approaching and people were realising that they may have to ride through it if we stayed for the full feast. 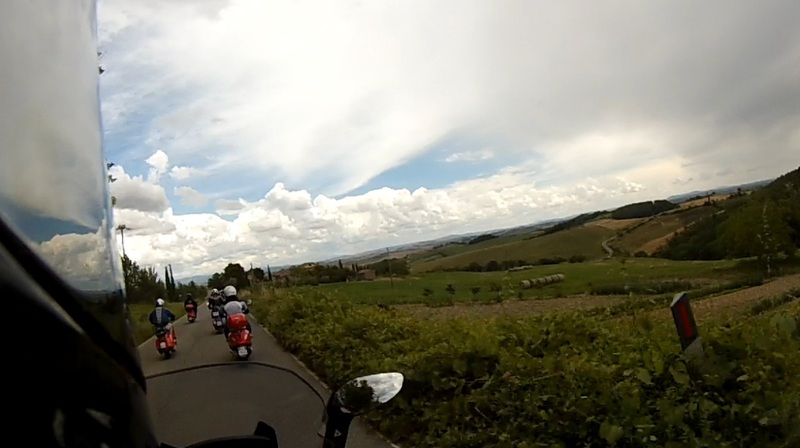 As the dessert plates were arriving, we and many others that had to travel in the direction of the clouds were getting ready to ride. 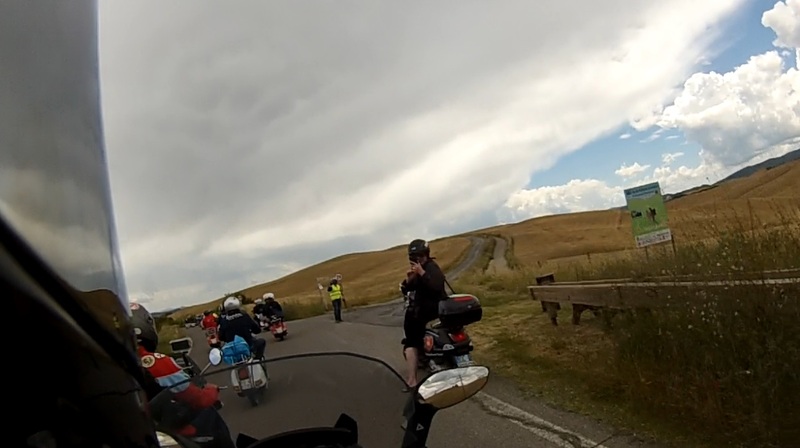 Drew did not have wet weather gear with him, (heck, he didn’t even have decent riding clothes, just shorts and a T-shirt!) 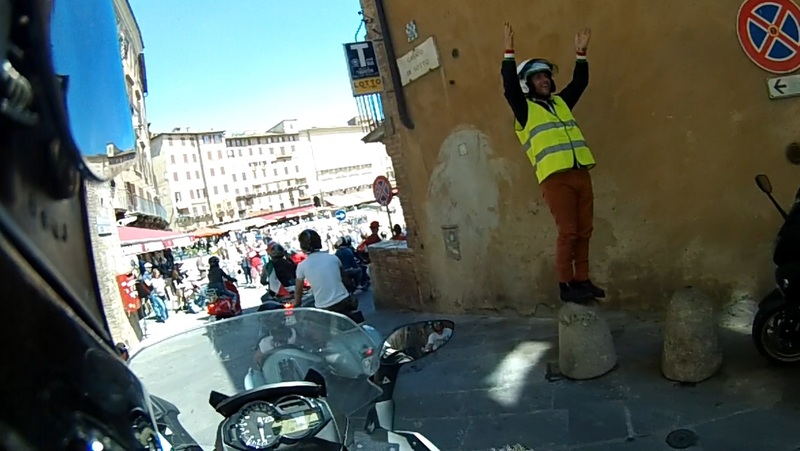 so a rubbish bin liner was found to give him some protection, and after thanking people and a little more banner trading we were off after a fantastic and memorable day. 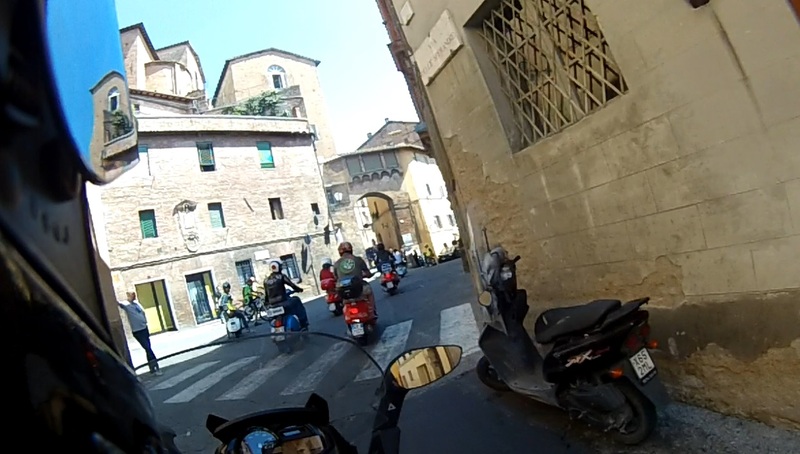 We saw lots of Italy and the Tuscany region, but taking part in an Italian scooter rally is something I wholeheartedly recommend to anyone and everyone that is interested in scooters and scootering to put on their bucket list and change your plans so that you can experience one of these. 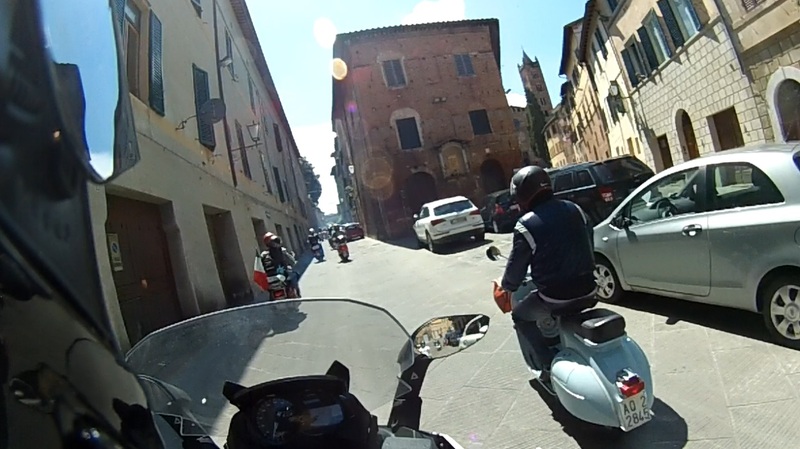 This has been made easier by New Tuscany Scooter rentals and Firenze Vespa club. 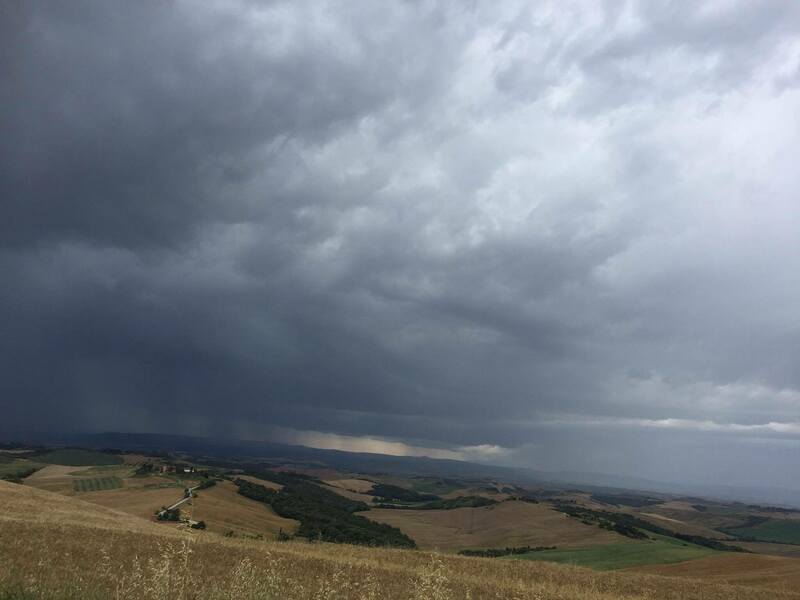 17/9 Colline e Cantine 2017 – Città di Fiesole in Fiesole – Remember to be careful with any vacation plans around this time of the year in Tuscany, as the Chianti Classico is run each year and can restrict your travel plans. 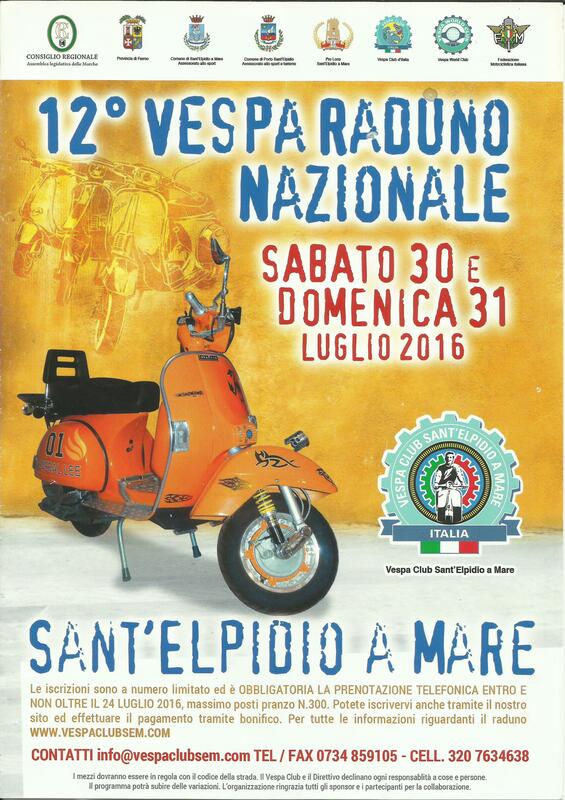 Rally dates are set by the local Vespa Clubs and so can’t be changed. 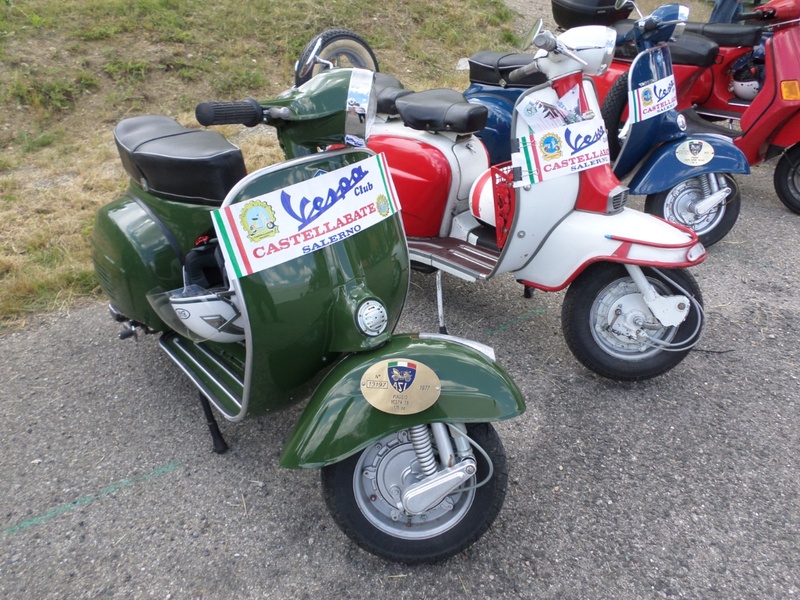 Italian Rallies do not go on late into the night as they do in North America and Very North America (Canada). 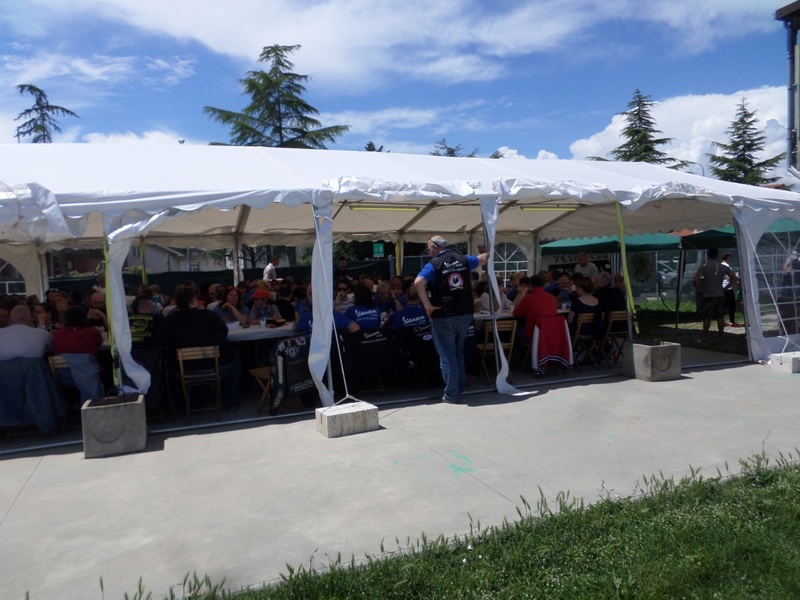 They start early with breakfast, ride and end in an amazing lunch, and then everyone wishes each other a farewell before returning to their lives. 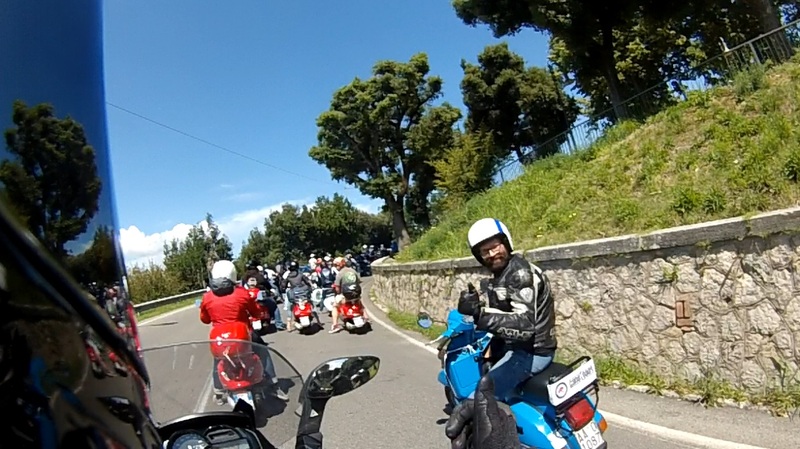 Rides usually start from the Rally starting point at 10 or 11 am. 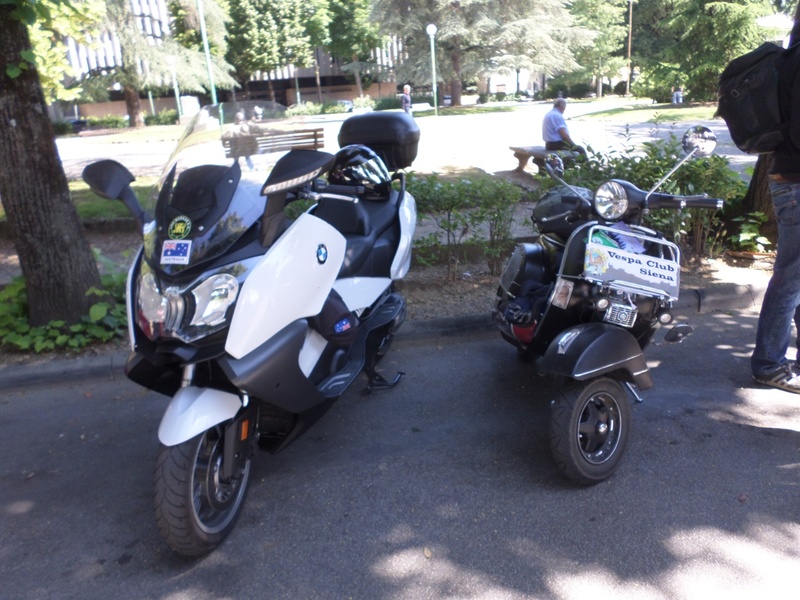 Departure times from our rental locations will vary depending on how far we have to travel to the rally and will take into account the time needed to complete paperwork. 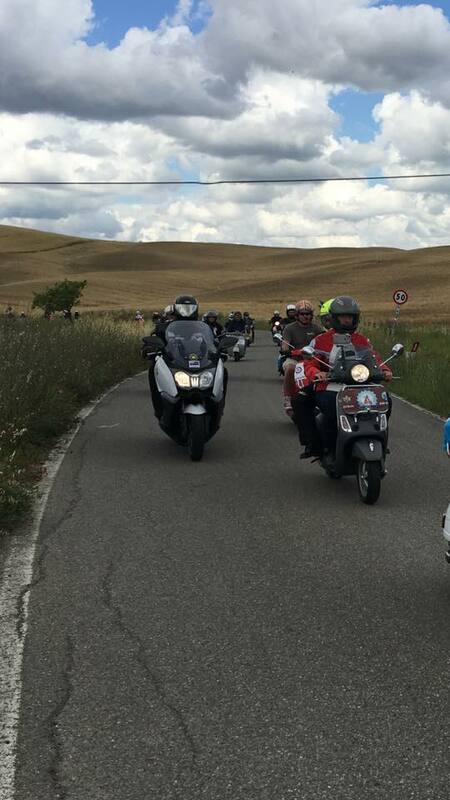 All of the Rally Tours will begin from one of the New Tuscany Scooter rental locations, either via Il Prato 50r, in Florence or via Trento Trieste 12, in Radda in Chianti. 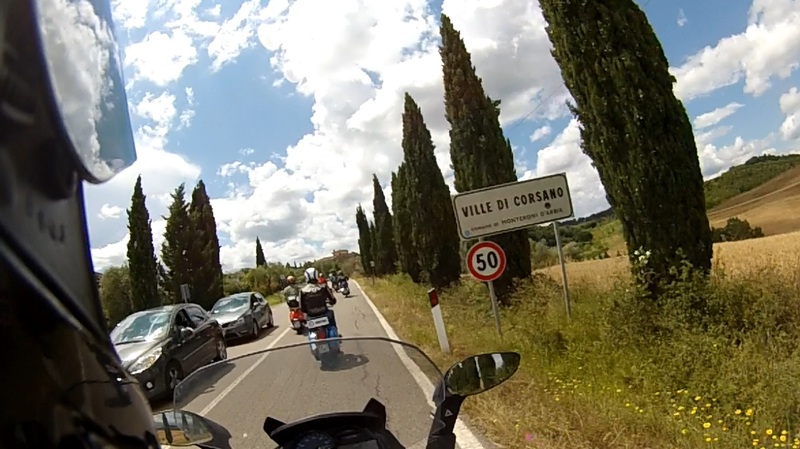 If possible you will ride from the rental location directly to the starting point of each Rally (all start in Tuscany). 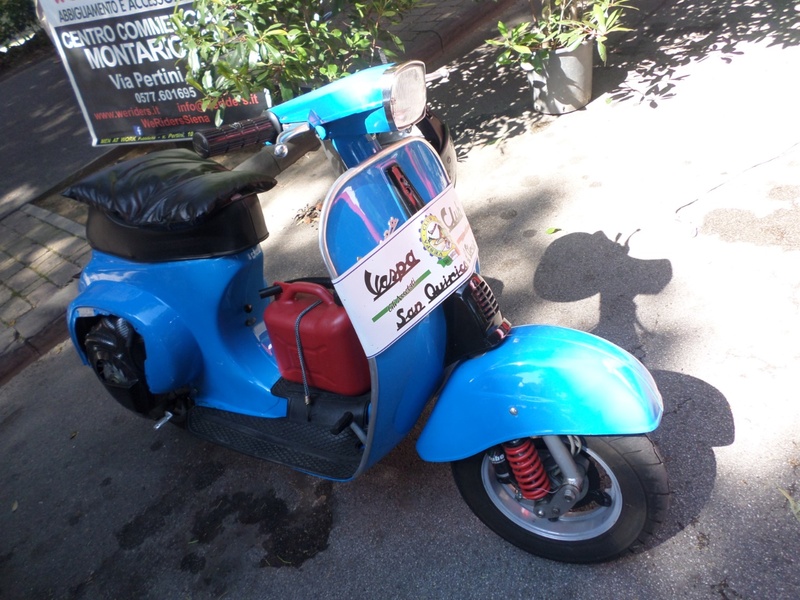 For some rallies this could mean a 2-hr ride, so, as an alternative, the scooters may be loaded onto a trailer and go by car. 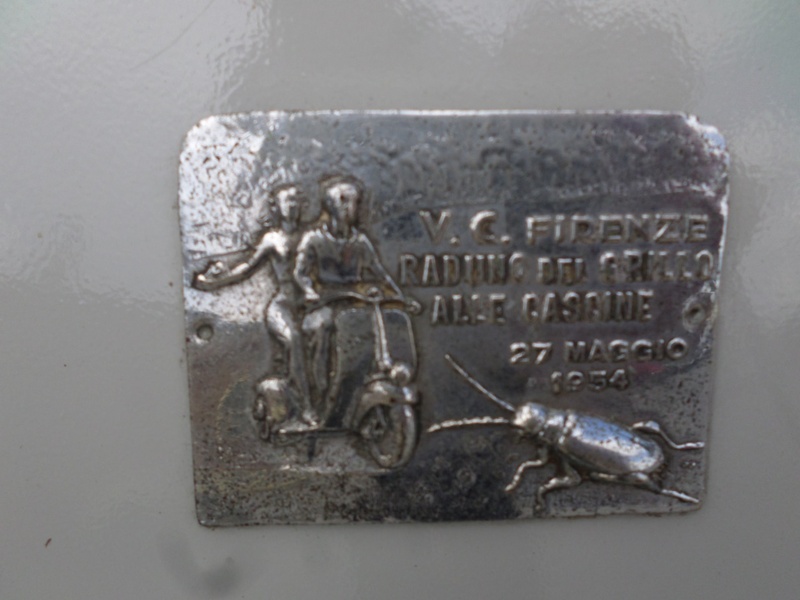 €150 per Vespa rider and €80 per back-seat passenger. 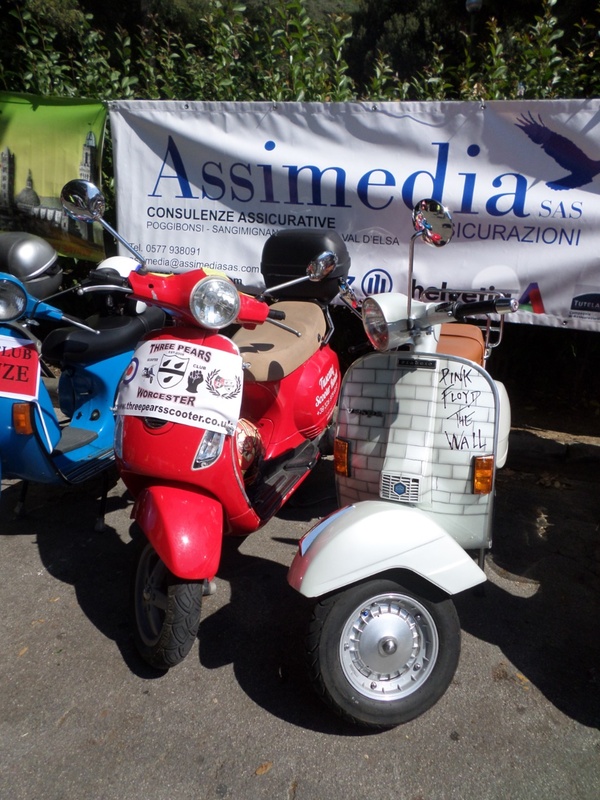 This includes a guide, Vespa rental, helmet rental, fuel, third-party liability insurance, rally enrolment and lunch. 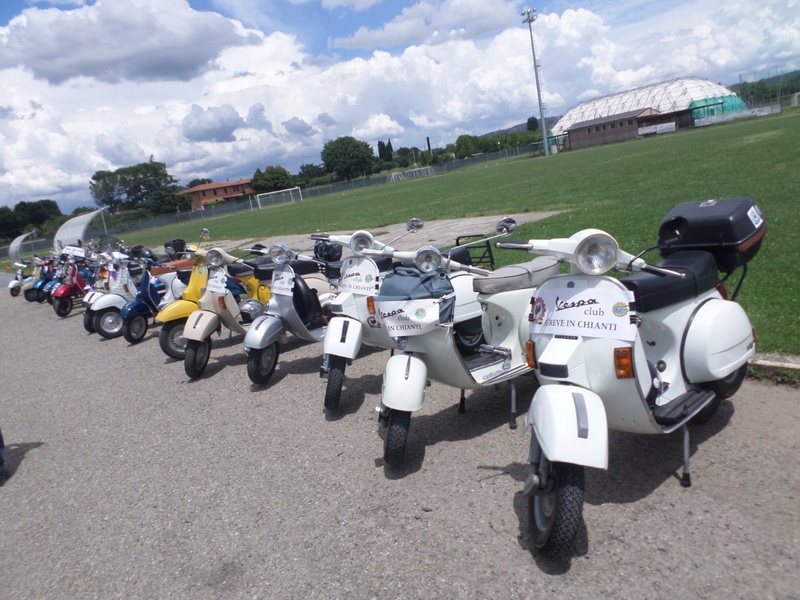 Once the maximum number of 8 scooters is reached, bookings will be closed. 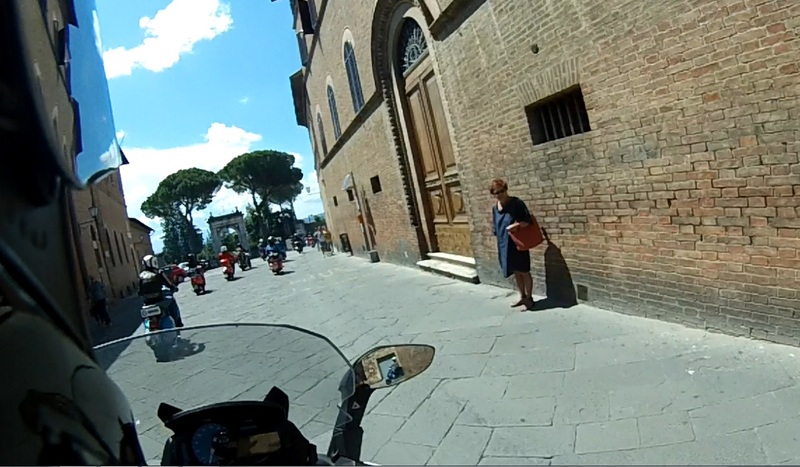 IMPORTANT NOTE: This is a tour for experienced scooter/motorcycle riders. 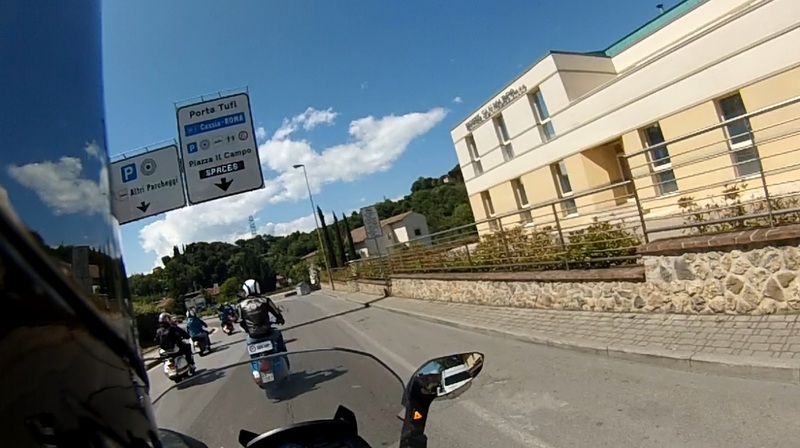 The routes covered and the group riding involved are not suitable for inexperienced riders. 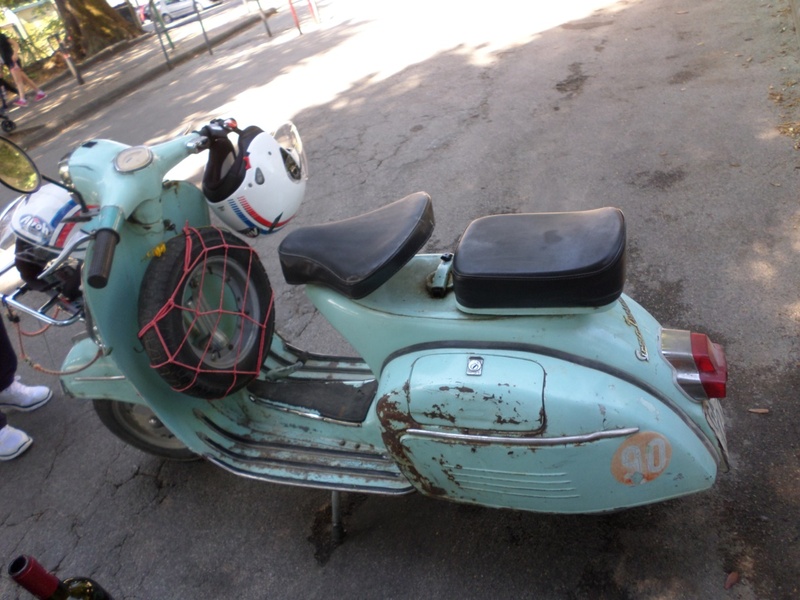 REQUIREMENTS: All the 125 cc and below scooters can be driven with a normal car driving license. 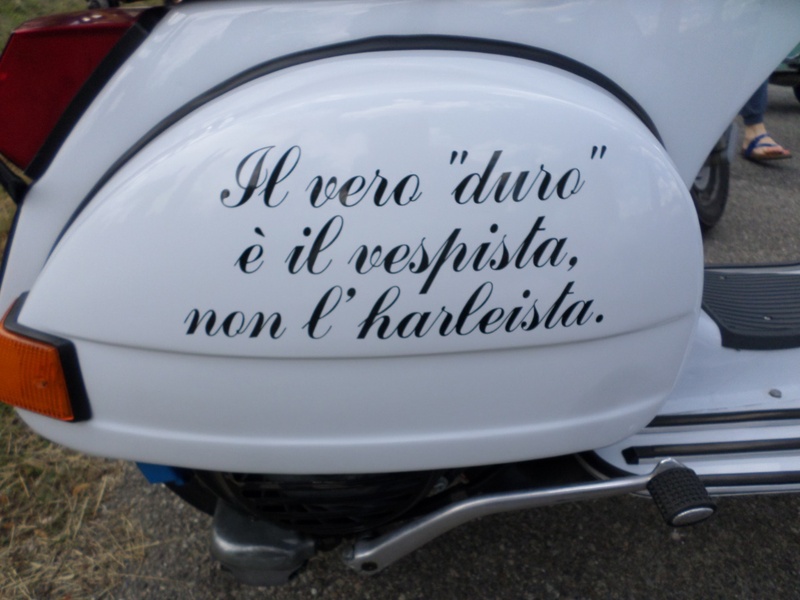 As long as your license can be read by the Italian Police, you don’t need an international driving license. They can’t accept licenses in Arabic, Cyrillic, Chinese, Thai etc. 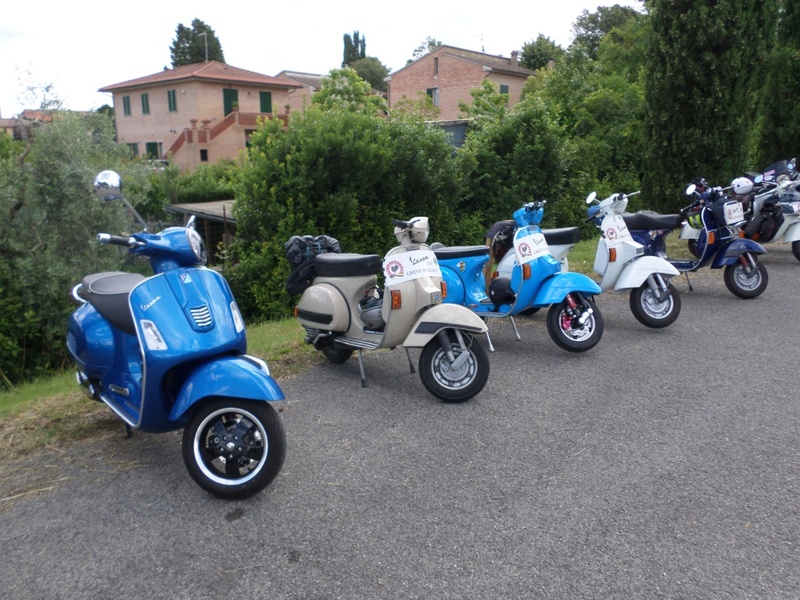 New Tuscany Scooter rentals does have larger capacity scooters, but you will need to provide a valid motor cycle license and only for the class you can ride at home. 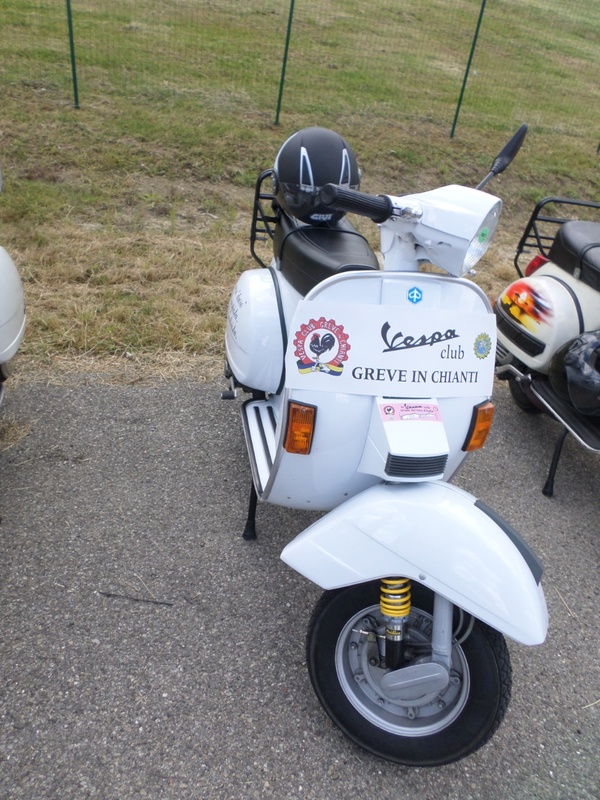 The BMW C650 scooter I was riding was arranged by the scooter shop, though the Vespa LX’s are more than adequate for the rally rides. 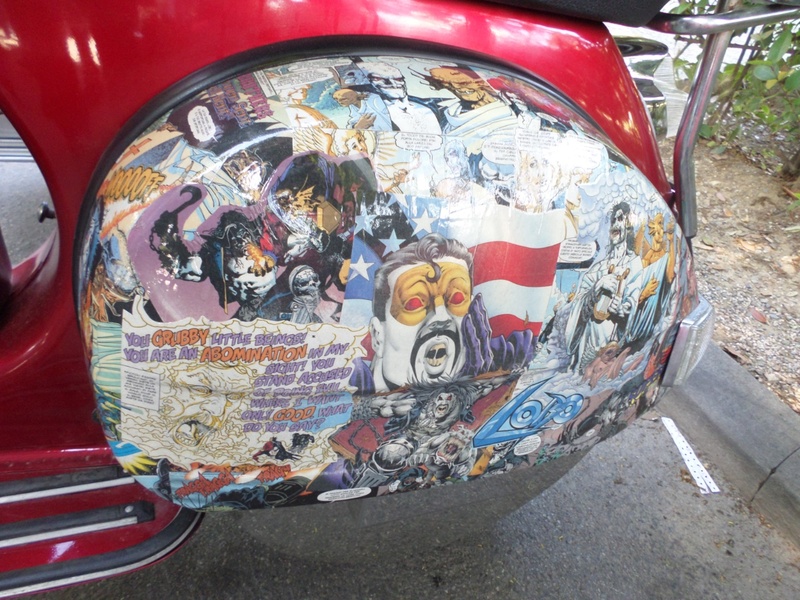 Yesterday we shared Randy Grubb’s amazing Decopod scooters. 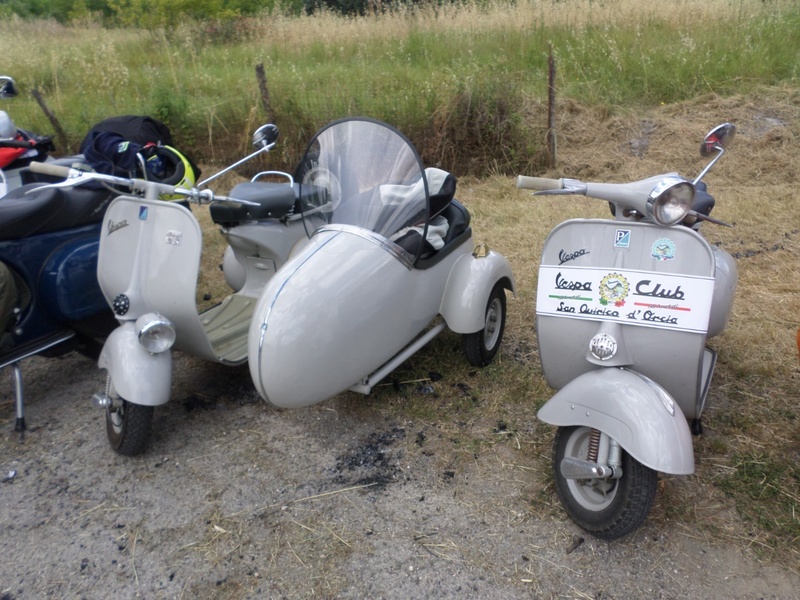 Based on Piaggio Fly 150s and MP3 250s, the Decopods represent one of the most remarkable custom scooters we’ve ever seen.